The Italian Renaissance brought about an explosion of great art, cultural change, and new ideas. Nowhere was this more present than in Florence. Through the backing of the wealthy Medici family, Florence produced such great artists as Donatello, Raphael, Leonardo, and Botticelli. Still, no artist is more celebrated than Florence’s favorite son, Michelangelo. 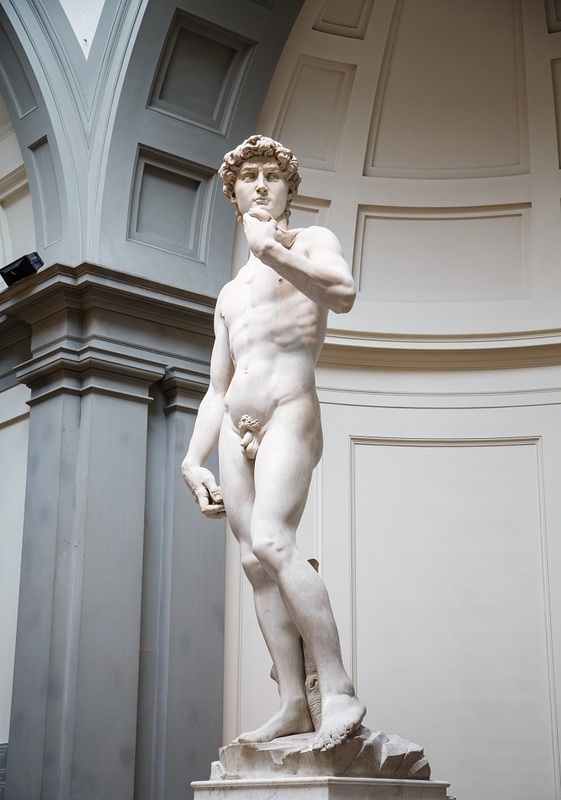 His greatest work, the statue of David, remains in Florence to this Day. More so than almost any other piece, Michelangelo’s David typifies the brilliance of Renaissance artwork in Italy. In fact, Michelangelo’s David is often referred to as the greatest sculpture of all time. Now kept in the Academia Gallery, the statue of David was never meant to be seen from so close a viewpoint. Michelangelo would roll over in his grave if he knew how close people were eyeing his masterpiece. The sculpture was originally meant to be placed in one of the niches on the facade of the Florence Duomo, some 260 feet up (80 meters). However, the city leaders realized that there was no way to lift this 14 foot marble statue to such heights. After some debate, they decided to place the sculpture of David in the spacious Piazza della Signoria, right in front of the Palazzo Vecchio. There, it was unveiled to the public on September 8, 1504. After nearly 370 years, the statue was moved inside in 1873 to protect it from the elements. Michelangelo was just 26 years old when he began working on the statue in 1501. The giant block of marble from which David was born had been rejected by two other artists due to it’s “imperfections.” However, Michelangelo was already the most famous artist of his time. His first masterpiece, The Pieta, had already been sculpted and can be seen currently inside of St. Peter’s Basilica in Vatican City. Michelangelo accepted the challenge and used his hands to create one of the greatest pieces of art ever made. As mentioned, the statue of David remains in the Academia gallery. After entering the gallery and proceeding through security, you’ll make an immediate left and be greeted by this great sculpture. David sits under a rotunda at the end of a short hallway. As you approach the statue, you’ll be walking down the “Hall of Prisoners,” named for the unfinished Michelangelo statues placed along the walls. These are the only other real pieces of note in the gallery, and I’d recommend coming back to those after you’ve spent your time with David. If there is room, you should view the statue in a counter-clockwise fashion. First, move to the right of the statue to get the best view of David’s face. Although, many other artists created their own versions of David, Michelangelo’s was special. To this point in history, all of the other works depicted David triumphant over the slain Goliath. However, Michelangelo’s David captures the young boy in the moments before battle. From this angle, you’ll be able to stare into David’s focused, steely eyes as he prepares to take on the giant. Moving around to the back of the statue, you’ll of course notice David’s backside. Take time to admire the detail work on David’s legs, arms, and back. You’ll also notice the stone in David’s right hand, ready to be placed into the slingshot. To get a better view of the hand, continue moving in a counter-clockwise fashion. From the left side of the statue, you’ll notice the incredible detail work. As you look at the detailed vein, knuckles, and finger nails, remember this was all done by hand. 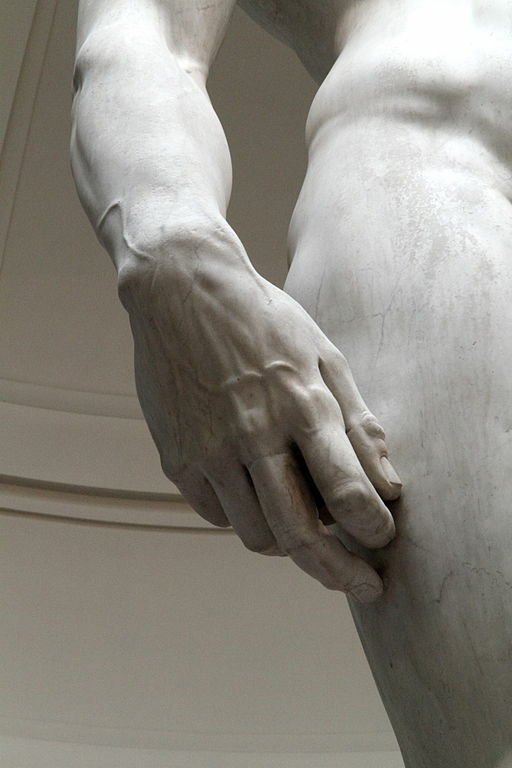 No casts were used in the creation of David. You may also realize that the hand is over-proportioned to the size of David’s body. This may be because Michelangelo wanted viewers to focus their attention on David’s hand and head – which is also enlarged. There isn’t much else of note to see at Academia. Other than Michelangelo’s unfinished “Prisoners,” the gallery is interesting but not full of important works. Plan to spend about 45 minutes there, but make sure that you get a skip the line pass. The gallery itself is very small, and admission is timed so it doesn’t get too crowded inside. That makes the line to get in incredibly long. You could easily spend an hour or two waiting to enter if you don’t have a skip the line pass. You can get them through the Academia Gallery website, or take a guided tour – which is what we did. The last thing you want to do is to waste your time in Florence standing in line. You should also head down to the Piazza della Signoria to see where the statue of David was viewed for centuries. There, you’ll find a copy of the statue in front of the Palazzo Vecchio. This is how Florentines viewed the statue for nearly 400 years. But don’t be fooled. It’s just a copy – a good copy, but a copy nonetheless. The Academia Gallery is open Tuesday through Sunday, 8:30 A.M. until 6:50 P.M. The museum is closed on Mondays. Ticket prices are €18.50 for adults and free to minors under 18. Also, you can gain free entry on the first Sunday of each month. Be sure to purchase your tickets in advance so that you can skip the extremely long lines at the ticket window and the entrance. If you are anywhere near Florence, carve out a bit of time to visit the statue of David. In a city full of masterpieces, this is one sculpture that can’t be missed!